And Joey Altair also claims that if you don’t manage to make the $30k as promised he’ll give you $1,000 cash just for entering – so is it actually legit or is 30 Day Challenge a scam that’s just out to part you with your cash? What Exactly Is The 30 Day Challenge? 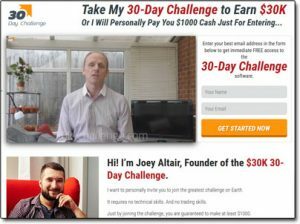 As I briefly mentioned above the 30 Day Challenge system is something that’s supposedly been created by a guy named Joey Altair & it can apparently make you guaranteed profits through automated trading. The website claims the average users typically make profits of $30k every 30 days & Joey claims that if you sign up to the system and don’t make that amount then he’ll personally give you $1,000 cash. Well, kinda – but almost too good to be true. I’ve seen a lot of these so-called “free” automated binary options systems launch over the years & literally every single one of them has turned out to be a flat-out scam that’s been set out to part people with their cash. But I’ll check it all the same, you know – just in case. How Does The 30 Day Challenge Work? Joey claims that anyone can make money with the 30 Day Challenge system, even if they’re never even heard of binary options before – which is a common statement made by a scam system. He says that all you need to do is sign up, deposit at least $250 with the broker that he recommends, hit the “start trading” button & then sit back whilst the money comes rolling in. However whilst that’s kinda the process, in reality it’s not quite that straight forward… and the guaranteed profits of $1,000 per day – well they don’t exist, and neither does the cash gift of $1,000. Whilst you’re led to believe that some guru has created this system using a special algorithm that will see you earning thousands of dollars each day on autopilot, sadly in reality that’s not actually the case. This system has actually been put together by the brokers, yes the brokers – and it’s nothing more than a ploy to part you with your hard earned cash so that they can make money at your expense. You see in general binary options trading is renowned for being extremely risky – the chances of you winning or losing are about the same as you determining which way a coin flip is going to land. And since these days most people are aware of the risks very few people are trading, which means the brokers are left struggling because nowadays nobody is really interested in binary options (it’s old news). So the brokers have been looking for a way to relight the fire & get people trading again because ultimately unless people are trading then they aren’t making money – and by the way when it comes to binary brokers take note that they only make money when you lose money, so it’s not in their interests for you to win. They’ve figured out that if they launch these “systems” that make people believe they can easily make lots of money without doing anything then they can get a whole bunch of people to sign up & start trading. But guess what? These systems don’t work as promised because as I mentioned above the binary options brokers don’t make money unless you’re losing money, so these systems are NOT designed to help you win. They’re just designed to get you to sign up and deposit. And when you do that’s when you’ll find out the hard way that these systems don’t work as promised – but if you think you’ll be able to get your money back think again, the brokers make it extremely difficult. I’ve seen a whole bunch of these things launching & they’re flat-out scams. Whilst the majority of them are currently focused on the binary market you should be careful because some, like the Trend Catcher system are starting to target the Forex market too. Basically when it comes to trading systems you should always do your research. 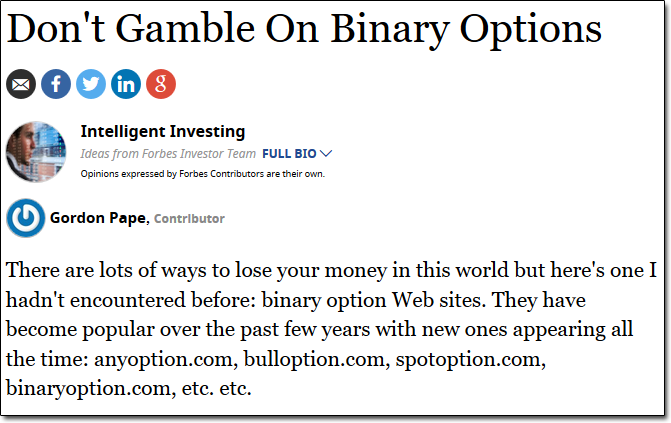 The reason there’s so many of these binary options scams is because they’re so good at catching people out, and the way they do it is by making you think that you can just “try it out” without any risk. You’re left to feel like there’s no upfront fee for the system & that you can just deposit funds then withdraw them if it doesn’t work out – but this is the trap. They’re lulling you into a false sense of security. The brokers that are associated with these binary options scams are generally rogue brokers & that means that if you deposit any money with them then the chances are they’ll make it next to impossible for you to get it back. Generally the only way you’ll have any chance of getting it back is by filing a chargeback which I explain how to do here. But of the course the best thing to do is to not give them any money in the first place. My Verdict – Is 30 Day Challenge a Scam? Yes it is, it’s clear that this 30 Day Challenge system is out to do nothing other than part you with your hard earned cash – it’s been created purely to sucker you into to depositing funds with the “recommended broker”. Whilst the system comes across as convincing it’s nothing but a ploy to lull you into a false sense of security, they’re just trying to make you think that it works so you’ll be more likely to start trading. It’s a common trick & the use of fake testimonials is something that often catches people out into making them think that it might be real, but don’t get caught out because it absolutely isn’t. Binary options trading on it’s own is risky enough (and nothing more than a gamble) but these scam systems are just making it 100x times worse & are only out to take your money from you. Therefore this system will be getting a huge thumbs down from me & I certainly won’t be recommending it because it’s obvious to me that it’s no different to any of the other binary options scams that have came before it. Writing Jobs Online Review – Big Scam or Legit High Paying Writing Jobs? My Story! Blazing Trader Review – Too Good To Be True?